Is ARE/poly(U)-binding factor 1 (AUF1) a new player in cytokine-mediated beta cell apoptosis? Type 1 diabetes is a chronic autoimmune disease involving the progressive loss of beta cell mass. Cytokines released by immune cells are early contributors to beta cell apoptosis. Thus, an understanding of the signal transduction mechanisms induced by cytokines in beta cells is necessary for the rational design of novel therapies to prevent or to cure this disease. Cytokine-mediated beta cell apoptosis is a complex phenomenon that includes activation of the transcription factors signal transducer and activator of transcription 1 and nuclear factor κB (NFκB), c-Jun N-terminal kinase, endoplasmic reticulum (ER) stress and the intrinsic mitochondrial apoptotic pathway. NFκB has both a pro-inflammatory and a pro-apoptotic role in beta cells. One of the mechanisms by which NFκB contributes to beta cell apoptosis is via activation of ER stress. The role for ER stress in beta cell apoptosis is not completely clarified but involves production of C/EBP homologous protein and activation of the intrinsic mitochondrial apoptotic pathway. In this issue of Diabetologia, Roggli et al (DOI 10.1007/s00125-011-2399-7) report on a new player in this elaborate response, the RNA-binding protein ARE/poly(U)-binding factor 1. This commentary discusses these findings and their relevance to the field. Beta cell loss in type 1 diabetes occurs slowly over years and >80% of the beta cell mass may have been lost by the time of diagnosis . Thus, interventions to efficiently prevent the development of full-blown type 1 diabetes must be performed in the early stages of the disease. Recent advances in the prediction of autoimmune diabetes by detection of islet cell antibodies  provide a window of opportunity to reverse type 1 diabetes. 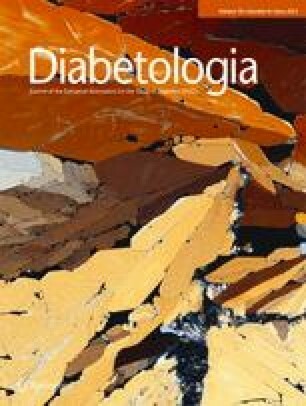 However, the lack of clear knowledge on how beta cells are progressively killed by the immune system during the early stages of the disease, and why transplanted islets are rejected following islet transplantation , jeopardises the success of interventional trials aimed at preventing type 1 diabetes [4, 5]. Successful treatment of type 1 diabetes should probably rely on combined therapies based on immunomodulators (to decrease inflammation and enhance protective immune responses) and agents that enhance beta cell function, survival and regeneration . A better understanding of the signal transduction mechanisms induced by early mediators of beta cell apoptosis in type 1 diabetes is necessary for the rational design of novel therapies to prevent or cure this disease. CD8+ and CD4+ T cells, macrophages and dendritic cells induce beta cell demise by different mechanisms, such as perforin and granzyme B release, Fas–Fas ligand interaction and by secreting cytokines and free radicals inside and around the islets . Production of inflammatory cytokines, such as IL-1β, IL-17, TNF and interferon-γ (IFN-γ), probably contribute to beta cell apoptosis in the early stages of the disease [8, 9]. Peculiarly, beta cells contribute to their own destruction by activating pro-apoptotic pathways and by secreting chemokines/cytokines that participate in the build-up of islet inflammation . Cytokine-mediated beta cell apoptosis is a complex phenomenon involving the regulation of hundreds of genes and proteins [8, 10]. The transcription factors nuclear factor κB (NFκB; activated by IL-1β and TNF) and signal transducer and activator of transcription-1 (STAT-1; activated by IFN-γ) are important regulators of beta cell apoptosis and inflammatory responses [8, 9]. Other signalling molecules activated by cytokines in beta cells are the mitogen-activated protein kinases (MAPKs) extracellular signal-related kinase (ERK), p38 and c-jun N-terminal kinase (JNK). Although p38 and ERK may play a role in beta cell apoptosis [11, 12], JNK activation seems to be the most important contributor [13, 14]. IL-1β and/or TNF activate the inhibitor of κB (IκB) kinase (IKK) complex, which induces phosphorylation of NFκB inhibitory subunit IκB, leading to its degradation and allowing NFκB to migrate to the nucleus, where it drives gene expression [15, 16]. It has been extensively shown that NFκB has a mainly pro-inflammatory and pro-apoptotic role in beta cells [17, 18, 19, 20], but long-term prevention of NFκB activation in beta cells from NOD mice accelerates the disease . This is probably due to the inhibition of the production of NFκB-dependent anti-apoptotic proteins, such as the X-linked inhibitor of apoptosis protein (XIAP) and A20 [21, 22]. The challenge ahead of us is to prevent the deleterious effects of NFκB activation in beta cells, without losing its beneficial effects. The pro-apoptotic effects of NFκB in beta cells are, at least partly, due to induction of FAS and inducible nitric oxide synthase (iNOS) [8, 9] (Fig. 1). iNOS production leads to the formation of NO, which has been shown to decrease endoplasmic reticulum (ER) calcium and induce ER stress and the unfolded protein response (UPR) in beta cells [23, 24]. Of note, although induction of UPR is related to NO production in rat beta cells , NO does not seem to be required in mouse islets . The mechanisms by which ER stress contributes to beta cell apoptosis are not completely clear, but induction of the pro-apoptotic proteins C/EBP homologous protein (CHOP), and death protein 5 (also called hara-kiri) (DP5) [26, 27], and downregulation of the anti-apoptotic protein myeloid cell leukaemia sequence 1 (MCL-1), probably play a role in this process . MCL-1 is a member of the B cell leukaemia/lymphoma 2 (BCL-2) family of proteins, which regulates the intrinsic (mitochondrial) apoptosis pathway in beta cells . The BCL-2 proteins can be divided into the anti-apoptotic proteins (BCL-2, BCL-XL, BCL-W, MCL-1 and A1), the multi-domain pro-apoptotic proteins (BCL2-associated X protein [BAX], BCL2-antagonist/killer [BAK] and BCL2-related ovarian killer [BOK]) and the pro-apoptotic BH3-only proteins (BCL2-like protein 11 [BIM], BH3-interacting domain death agonist [BID], DP5, p53 upregulated modulator of apoptosis [PUMA], BCL2-associated agonist of cell death [BAD], BCL2-interacting killer [BIK] and Noxa) . Cytokines mediate upregulation of the BH3-only sensitiser DP5 . Once transcriptionally activated, DP5 selectively binds and represses the anti-apoptotic protein BCL-XL (Fig. 1). This is paralleled by the decrease of two other important anti-apoptotic proteins: BCL-2 and MCL-1 , and by the increase in expression/activation of the BH3-only proteins PUMA and BIM [30, 31]. Activation of the BH3-only proteins results in BAX translocation to the mitochondria, outer mitochondrial membrane permeabilisation, cytochrome c release, caspase activation and consequently beta cell apoptosis [9, 28, 32]. Activation of the intrinsic apoptotic pathway is a key event in cytokine-mediated beta cell apoptosis [7, 32, 33], and overproduction of BCL-2 , BCL-XL  and MCL-1 prevents cytokine-induced apoptosis in vitro . In vivo experiments, however, have shown that BCL-XL overproduction induces beta cell dysfunction , while increased production of BCL-2 is not sufficient to prevent autoimmune destruction of beta cells . Identification of novel molecules that modulate this cell death pathway will hopefully provide alternative approaches to prevent beta cell apoptosis in early type 1 diabetes. In this issue of Diabetologia, Roggli and colleagues investigated the role of the RNA binding protein ARE/poly(U)-binding factor 1 (AUF1) on cytokine-mediated beta cell apoptosis . This protein interacts specifically with adenosine- and uridine-rich elements (ARE) located in the 3′ untranslated region (UTR) of target mRNAs, thus regulating their stability . The AUF1 protein can be found in four different isoforms, arising from differential splicing, which are localised in the nucleus and can migrate to the cytosol where they associate with the heat shock proteins HSC70–HSP70 and HSP27, translation initiation factor eIF4G, poly(A)-binding protein (PABP) and other unidentified proteins to form a multisubunit complex known as the AUF1- and signal transduction-regulated complex (ASTRC) . This complex recruits messenger ribonucleases to degrade ARE mRNAs, such as TNF, IL-1β, IL-2, IL-10, the oncogene myelocytomatosis viral oncogene homologue (MYC) and BCL-2 . Roggli and co-workers observed that MIN6 cells and human islets produce all the different AUF1 isoforms . Exposure of MIN6 cells to cytokines induces their translocation from the nucleus to the cytosol, indicating their activation. By overproducing or knocking down the different isoforms of AUF1, they showed that it has no effect on beta cell function. AUF1 activation, however, induces apoptosis in MIN6 cells and human islets. The authors went a step further to unveil the mechanisms by which AUF1 contributes to cytokine-mediated apoptosis. They observed that knocking down AUF1 leads to a decrease in cytokine-mediated IκBα phosphorylation and hampers the induction of NFκB-dependent genes in beta cells, such as iNos (also known as Nos2) (Fig. 1). The effect of AUF1 on NFκB activation was also observed in a recent study in macrophages. In these cells, AUF1, by an unknown mechanism, promotes the translation of transforming growth factor-β-activated kinase (TAK1), which phosphorylates the IKKβ subunit within the IκB kinase complex to activate NFκB-regulated genes . It remains to be determined whether a similar mechanism occurs in beta cells. By regulating NFκB activation, AUF1 not only controls critical apoptotic pathways in beta cells but also interferes with the inflammatory responses elicited by this transcription factor (Fig. 1). In line with this, AUF1 knockdown attenuates cytokine-mediated induction of the genes encoding chemokine (C-X-C motif) ligand 2 (Cxcl2)/MIP2 and chemokine (C-C motif) ligand 2 (Ccl2)/MCP1 chemokines in MIN6 cells . The authors showed that cytokine-mediated AUF1 activation in beta cells is downstream of ERK. This is in contrast to a previous study showing that blockage of ERK activation decreases the transactivating capacity of NFκB, but it does not prevent IL-1β-mediated IκB degradation and NFκB nuclear translocation . Therefore, further studies are necessary to clarify this discrepancy and to better dissect the role of AUF1 in the regulation of NFκB activity and expression of downstream NFκB target genes. Besides regulating NFκB, AUF1 also seems to contribute to cytokine-mediated apoptosis via downregulation of the anti-apoptotic BCL-2 and MCL-1 proteins. Although a direct role of AUF1 in Bcl2 mRNA stability has been observed, it is not yet clear how AUF1 regulates MCL-1. MCL-1 has no ARE site and cytokines regulate MCL-1 expression post-translationally . The effect of AUF1 on MCL-1 may thus result in its effects on NFκB activation and NO production . As mentioned above, cytokine-mediated beta cell apoptosis is a complex phenomenon. The study by Roggli et al has added a new player in this elaborate response, showing that AUF1 contributes to both cytokine-mediated beta cell apoptosis and inflammatory responses. These results are interesting but they should be interpreted with caution, as most of the study was performed in a tumoural cell line (MIN6 cells). However, the fact that the authors observe a pro-apoptotic effect of AUF1 in human islets, and that the role of AUF1 in regulating NFκB activation has previously been observed in monocytes, indicates that these results are indeed relevant. Owing to its properties of influencing distinct pro-apoptotic and pro-inflammatory responses in beta cells, AUF1 may be considered as a candidate in the prevention of beta cell apoptosis in type 1 diabetes. We must keep in mind, however, that in immune cells AUF1 has a primarily anti-inflammatory effect and AUF1 knockout mice develop chronic dermatitis and respond with a severe endotoxic shock upon endotoxin challenge [41, 42]. To further clarify the role of AUF1 in type 1 diabetes, it will be necessary to evaluate the role of this protein in insulitis and beta cell death in in vivo models of the disease, such as NOD mice. The authors are grateful to D. Eizirik and F. Allagnat for critical reading of the manuscript and suggestions. A. K. Cardozo is a Research Associate of the FNRS (Fonds National de la Recherche Scientifique), Belgium, and E. C. Vanzela receives support from CAPES (Coordenação de Aperfeiçoamento de Pessoal de Nível Superior), Brazil. Both authors were involved in the conception of this commentary. The authors drafted the article or revised it for intellectual content and gave final approval of the version to be published.